Welcome back to day fourteen of our thirty-day series on Success in Power BI! Today we will take an opportunity to switch gears as this morning I got a notification on my desktop to update my Power BI installation. 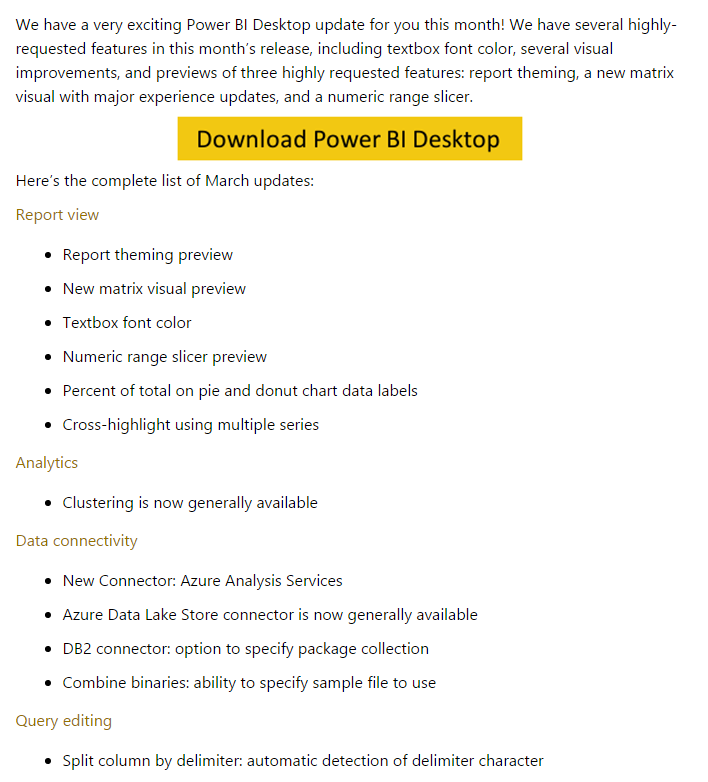 This is one of my absolute favorite features of Power BI: MONTHLY UPDATES with new features! Being a consultant for Innovative Architects, this makes my job much harder because I may tell a client one thing in March and then that is incorrect in April. I am perfectly OK with that because: NEW FEATURES!!!! So if you are following this blog in real-time, you are going to want to update your Power BI as well to the March 2017 version to prevent any incompatibilities with my version. Look at the features and improvements in Figure 1. Check out the last item on the list…split column by delimiter. Does that sound familiar? It should as we did that manually using calculated columns in Day Ten. This is the perfect example of what I referred to earlier at IA. I may have told a client that you could not easily split a column by delimiter. Now you can. Isn’t that fabulous? Thanks Microsoft! Below is the video from them on the new features. Stay tuned to see where we go next! Posted on March 11, 2017, in Business Intelligence, PowerBI and tagged PowerBI. Bookmark the permalink. 1 Comment.